Acupuncturists know how to heal patients with holistic treatments – but are rarely good at marketing their services to attract new clients. The majority of acupuncturists rely on word of mouth referrals. This may sustain business for a bit – but you cannot get more business if no one knows who you are. With search engines and social media taking up the lion’s share of attention in all demographics and age groups – digital marketing is where acupuncture clinics should be focusing their attention. 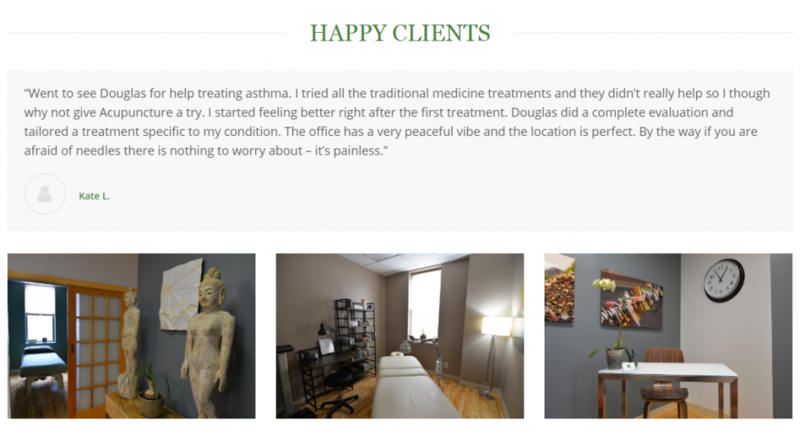 By showing results through testimonials, showcasing your brand new facilities, or just by letting people know who you are – your practice will be able to generate clients seeking holistic care. In this marketing guide for acupuncture clinics – we will explore the main channels of digital marketing and the exact steps you need to take to utilize them effectively to attract more patients. Search engine optimization is the most effective channel of marketing for Acupuncture clinics everywhere. With a proper search engine optimization strategy, a clinic can generate inbound leads that will come in regularly without additional marketing spend. This is done through two primary channels – your website and Google My Business. Your clinic’s website needs to have an inviting user experience so people looking for you will feel welcomed when they discover you online. The user experience can be broken down into two categories – content and design. When talking about the latter – your website’s design needs to load very quickly so it is favored by Google. Additionally, with a website’s design, you must make sure that everything is technically sound from an SEO perspective. This means making sure that your on-site SEO is solid by checking that your title tags, meta tags, alt tags, site structure, and keyword targeting are done correctly. The website needs to provide a great experience for visitors so they don’t leave your site after they’ve landed on it. This can be done by using pictures that convey who you are, how your facilities look, and pictures of satisfied clients. Make sure you have a clean design with a clear call to action. More importantly, make sure that your name, address, phone number, and social profiles are easily accessible so that the user can explore more about you or contact you immediately. When thinking about content, the most important element you need is social proof. Social proof can come in the form of text (written testimonials) or video testimonials which are even better. Videos will increase the time a visitor stays on your site. This signals to Google that your site is something worth boosting in the search engine results. The other piece to the puzzle is increasing your authority online. This can come in the form of written blog posts that cover specific case studies, observations, or answers to general inquiries. Another way to produce content that increases your authority is by creating videos on platforms such as YouTube. YouTube videos on the benefits of holistic care such as acupuncture and the possible relief it can provide are great ideas for your practice to increase their exposure. Google owns YouTube so by using both platforms correctly – it increases your chances of appearing for competitive search terms. Speaking of search terms – the most valuable keywords for acupuncturists are location based. 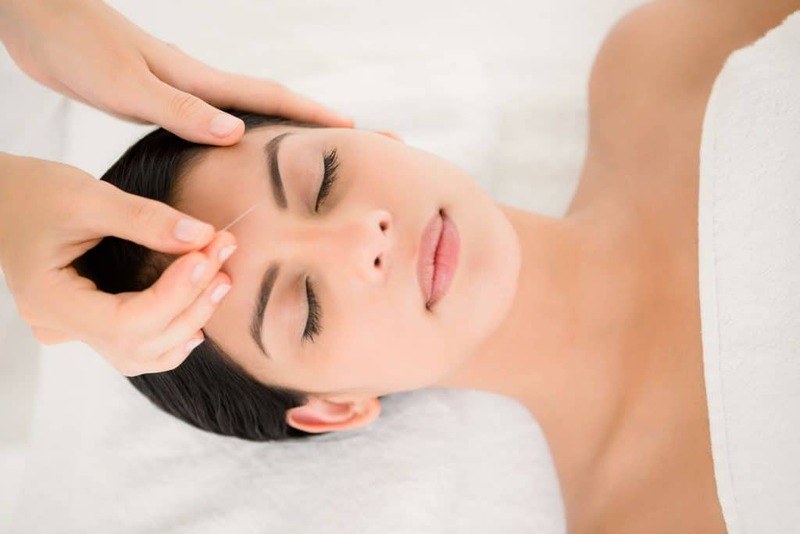 For example – “acupuncture NYC”is performed by people probably looking for an acupuncturist in their area. 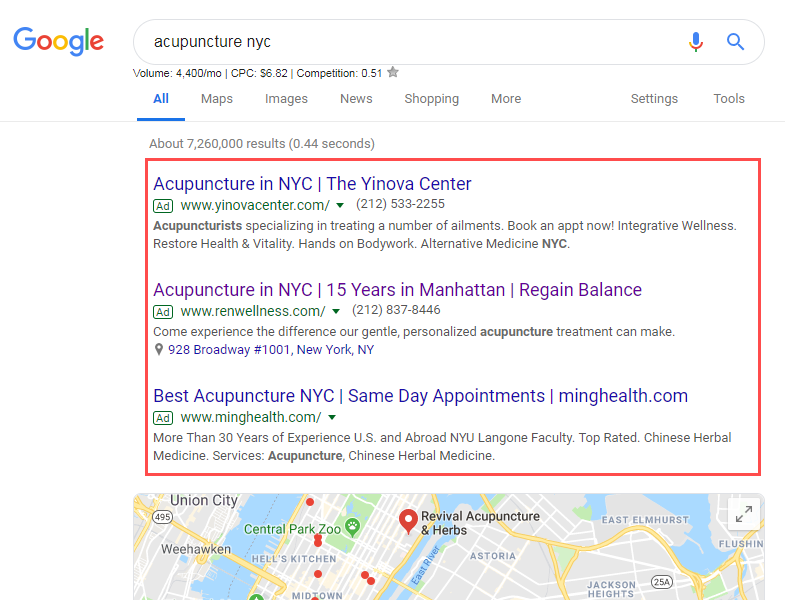 This can be used at a State, City, or even hyper-local level where the search term would be “acupuncturist near me.” If you take a look at what pops up when people are searching for these keywords – you’ll see that Google provides a map with 3 listings that they recommend. Another thing to note is that there are approximately 4,400 searches per month for this keyword! That’s potentially 4,400 more patients per month that are looking for acupuncture care in NYC. According to Forbes, the first page of Google captures 92% of search results and the top 5 results on the first-page capture 67.6% of all clicks. 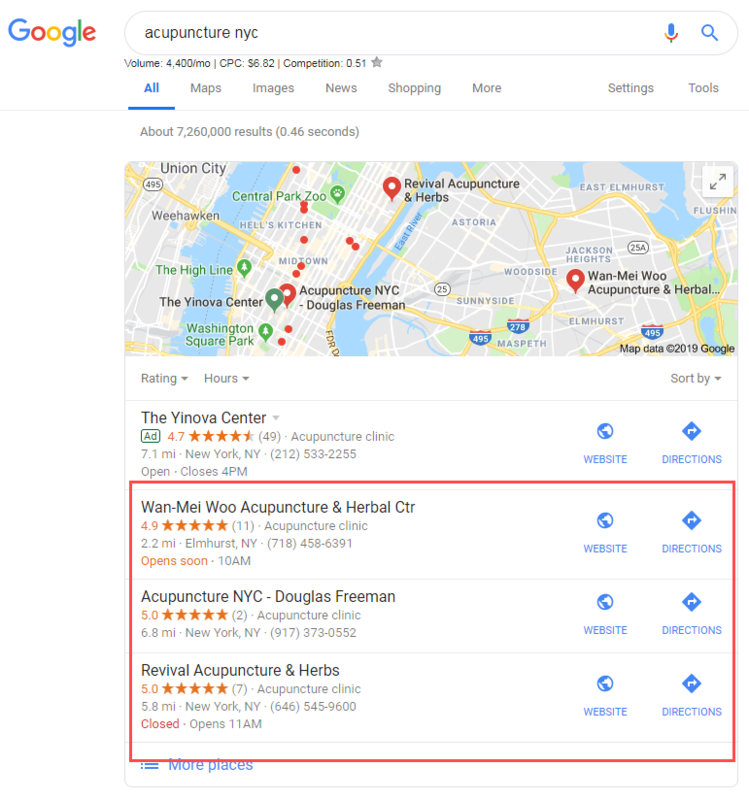 Google My Business (GMB) listings recommend the top three acupuncturists in the targeted location. You can see why it would be extremely beneficial to get your practice on this list. Here are some ways to increase your GMB listing so your practice can appear on the top of the Google My Business search results. First, make sure that all the information is filled out correctly. This is particularly important for your business name, address, and phone number. If people have trouble matching your business name, address, and phone number to another directory such as Facebook – they might not trust that you are a legitimate establishment. Google similarly takes the same stance when they find differing information across the internet and will not rank your business because of this. Second, try and provide as many photos of your office as you can. This includes shots of the exterior, interior, team, and professionals at work. This increases both the consumer’s trust and Google’s trust in your business. Another effect of numerous photos on your listing is that it eases patients into visiting your practice physically because they feel like they have toured the facility through pictures already. Google Posts, you can add posts of up to 300 words with pictures and link to it with call to actions like “get offer”, “buy”, “sign up”, “reserve”, and “learn more”. You can use these posts to advertise discounts or certain products for your practice. 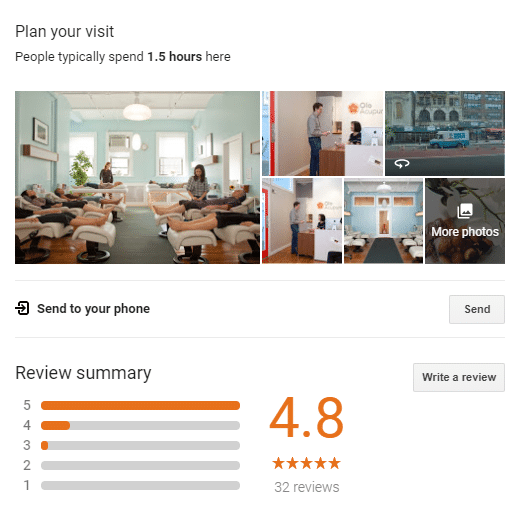 These posts will pop up alongside your Google My Business listing – making it easier for users to convert into patients. Third, and most important, is to generate and manage your reviews well. Reputation management is becoming the most important factor to local businesses online. People are now trusting reviews as much as a personal referral before visiting a location. You can see why it is imperative to reply to every comment – positive or negative – and show potential customers that you care about what they think. There are reputation management systems that can help your business generate and maintain positive ratings online. A powerful marketing strategy used in conjunction with SEO is Google’s pay per click advertising program. Google PPC can boost your website to the first page of the search results to appear for certain keywords. The best part of it all is that you only pay when someone clicks on your link! The trick with Google PPC, and running campaigns properly, is to hyper-target your keywords and qualify customers before you have to pay for a link click. For example, in your Google Ad for acupuncture + “your location” you will want to list all the ailments that your practice can treat. If you are specifically advertising that you treat allergies, back pain, and anxiety – you won’t have patients clicking through to your link who are looking for treatments for infertility. This kind of optimization makes your campaigns more profitable and your potential patients more qualified. The keywords you want to target are the specific phrases that will convert the most eligible patients. These are namely your branded keywords, such as your practice’s name, acupuncture + your city, the main ailments you treat, and the treatments you provide. You want to be on the top of Google’s search results for your brand because it means people are searching for your services specifically. Make sure you are careful and organized in your keyword bidding because unoptimized campaigns can get out of control quickly. Consult with a Google Ads specialist if you’re considering running pay-per-click ads. In addition to Google PPC – a channel of digital marketing you want to consider is Facebook Ads and Messenger Marketing. Facebook currently has over 2.27 billion monthly active Facebook users! That is a huge range of people that you can possibly target. The beauty of social media marketing is how creative you can get. Facebook Ads coupled with a Facebook Pixel can provide huge opportunities to highly target those patients that need you the most. For example, if you had completed the steps above to list your website on the top of the search results and a potential patient clicked through to your website – you can retarget them on Facebook again to prominently display your practice. You can even go as granular as determining what service they looked at on your website, for instance anxiety treatment, and serve them targeted ads related to the benefits of acupuncture on anxiety. This hyper targeted advertising allows you to communicate with a warm audience instead of having your message fall on the deaf ears of a cold audience. Additionally, you can serve ads based on geographic location and demographics that can be set within the Facebook Ads Manager. 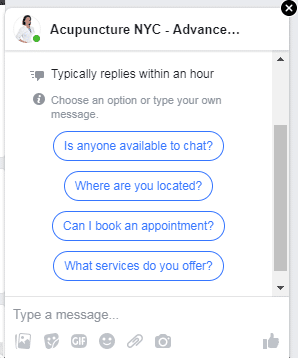 This means you can run Facebook Ads to people that are interested in acupuncture that are within a 10 mile radius of your practice. Messenger Marketing is becoming increasingly effective in generating potential patients to visit your practice. When running Facebook Ads – instead of leading the user to a landing page or a website – try driving them directly to Facebook Messenger. They can talk directly with you or a receptionist to answer any questions and concerns they may have before booking an appointment to come in. This is extremely effective because they are able to talk with a real person instead of interacting with a static webpage. Facebook Ads can also be used on Instagram. Instagram is great for visual marketing of your practice. If you want to showcase your facilities or have a brief conversation about back pain Instagram is the platform to do it. Additionally, you can also pay for micro influencers to come and get treatment from you and post it to their audience. This increases your online reach through another authority. It is a marketing strategy that is rarely used but is highly effective because it is a more natural way to advertise than paying for ads. The tried and true form of online marketing is through email. Many people downplay how effective email marketing is – they don’t know what they’re talking about. The last time an email came in and your phone dinged to notify you – did you check what the email was? Exactly. Because mobile usage is increasing and our emails are linked to our phones – email marketing is even more effective than when smartphones were not as prominent. It’s important to generate a thorough email list so you can send emails their way to inform them of news, recipes, products, or special offers. To gather a new list, you can run Google Ads and Facebook Ads to a landing page to capture their emails. 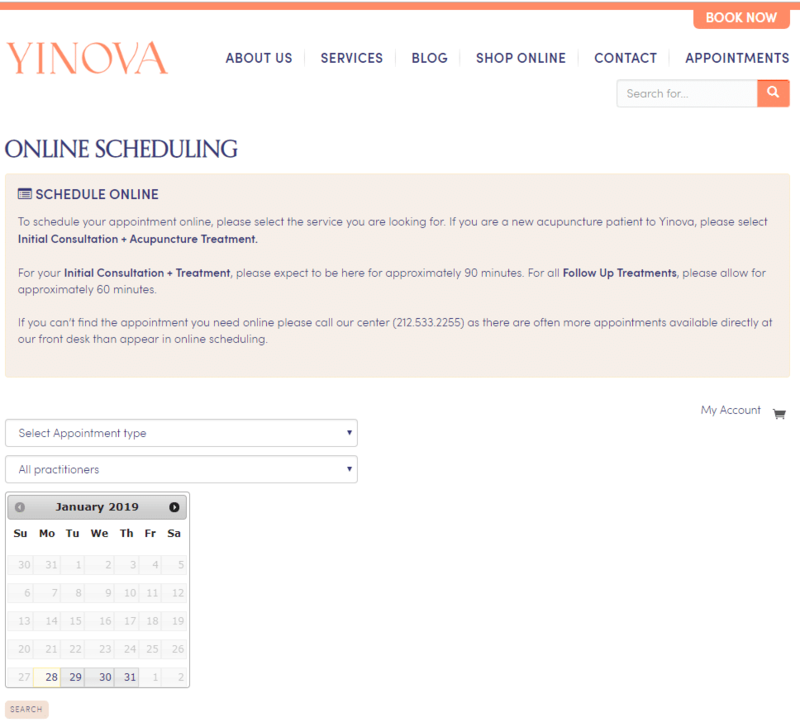 Or – the most effective way is to have patients book appointments online through your website. When they book the appointment they will input their email to receive confirmation of their successful booking and your practice has earned another email. So now you have a giant email list, what do you do with it? The best way to nurture an email list is to send valuable information their way that they would want to read. For example, remember the pieces of video content we were creating before? Well, you’d want to share that with your email list. Additionally, if you have a blog post on the benefits of acupuncture on infertility – you’d want to share that as well. Through your email list, you become an authority and a friend that your patients know, like, and trust. Eventually, you’ll want to send out a lead magnet to get them back into the clinic – this can be a discounted session or a free consultation. Digital Marketing for acupuncture is becoming more prevalent and necessary in today’s marketplace. Consumers are highly sensitive to search engine results and online reputation. 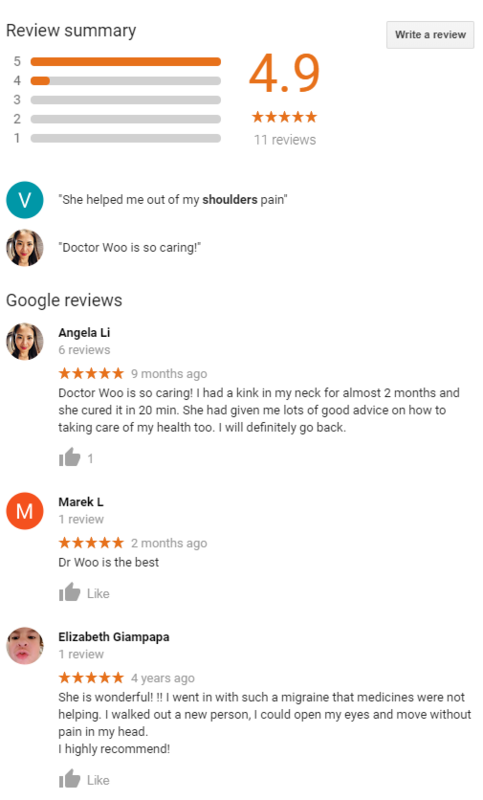 This is why acupuncturists must be up to date with their digital marketing strategy to maximize the people they can care for. If one more person is able to live a healthier life by identifying your practice as the ideal fit – your marketing strategy is working. 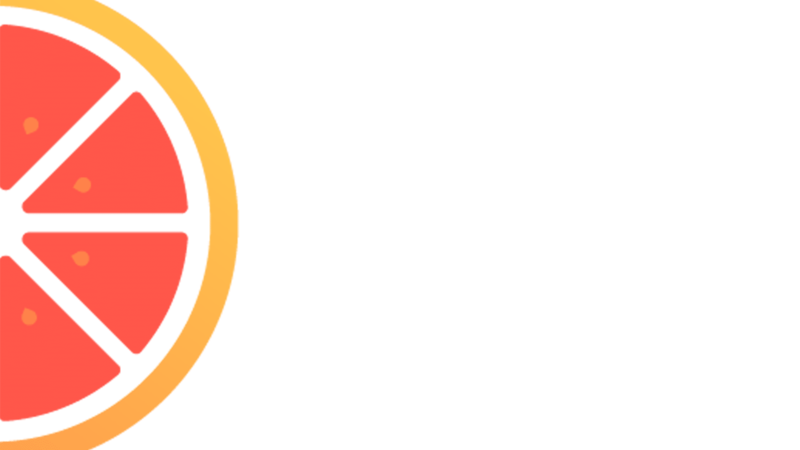 Pomelo Marketing loves working with Acupuncturists in the United States and Canada to develop a unique marketing strategy that will help your practice stand out from the rest. We collaborate with you to identify who your ideal clients are and how to market to them for maximum exposure. We provide a full range of solutions from website design and development to paid media advertising. Feel free to contact us for a 15-minute strategy session to discuss your acupuncture business.